The Civil War had a dramatic impact on the culture, politics, and geography of Virginia. Battles ravaged the landscape, blockades and other political maneuvers transformed the economy, and profound regional tensions resulted in the creation of West Virginia. This exhibition seeks to illuminate how Virginia was changed by the war, focusing on the voices of those who experienced it. The letters, diaries, scrapbooks, maps, newspapers, song sheets, photographs, and objects on display reveal the stories of these Virginians. Who shall tell the story?…We talk I say of stories of this war—have histories of this war already; and shall have books of full detail, hundreds of them. In printed books, full histories of this war will come. O heavens! What book can give the history of this war? 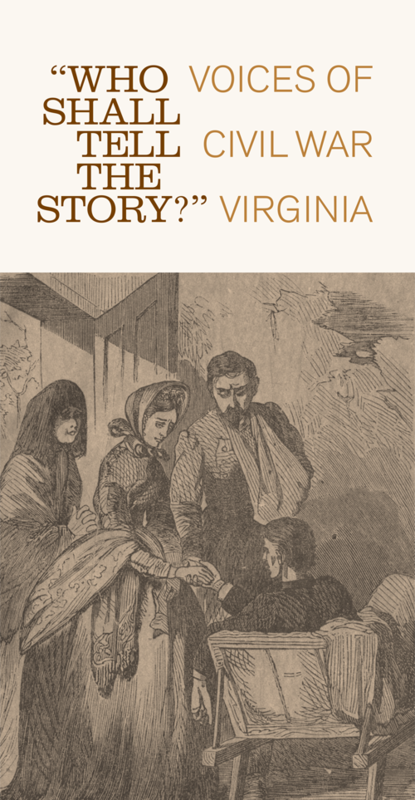 The war stories featured here include those of Confederate and Union soldiers, working women and war widows, black troops and southern Union sympathizers, freed and enslaved people and prisoners of war, schoolchildren and University of Virginia students, poets and musicians, nurses and wounded soldiers. Diverse and contradictory, these stories confirm the continuing relevance of Whitman’s question. Curated by Gayle Cooper, Edward Gaynor, Petrina Jackson, Ervin Jordan, and Molly Schwartzburg, Albert and Shirley Small Special Collections Library, University of Virginia. The exhibition is on view through summer 2015 in the main gallery at the Mary and David Harrison Institute for American History, Literature, and Culture, and the Albert and Shirley Small Special Collections Library. Click on the "Visit" link at left for more information.